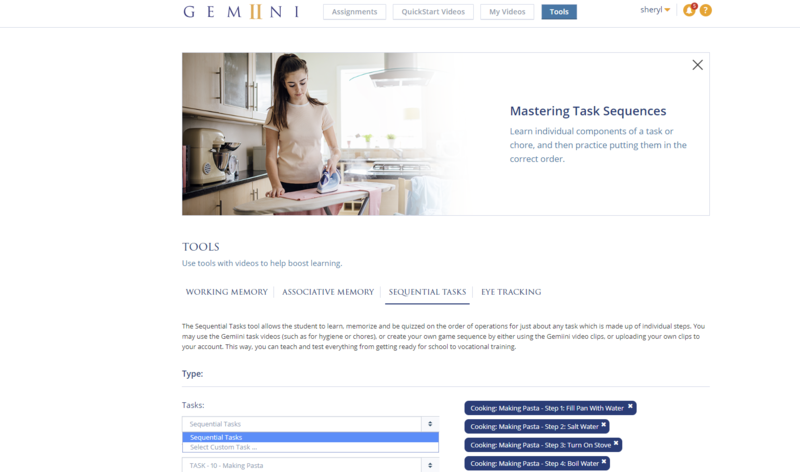 When you set up a Sequential Tasks Activity, you can choose one of Gemiini's pre-made chores videos, or you can create an activity from a custom video assignment that you have built in your managing account, for example, a video on how to tie shoes or fold a towel. 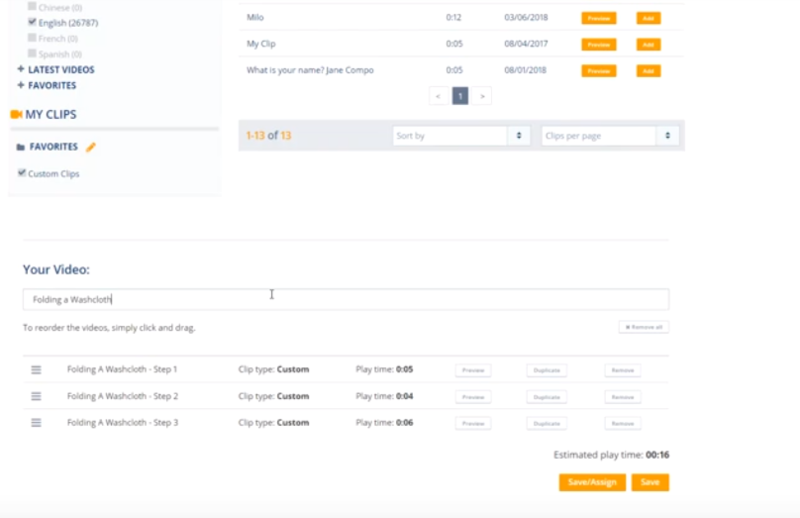 Using personal recordings with the Sequential Tasks Tool gives you the power to teach the sequence of steps in any activity that your student is learning, with recordings of people, places, and objects they recognize from their own experience. 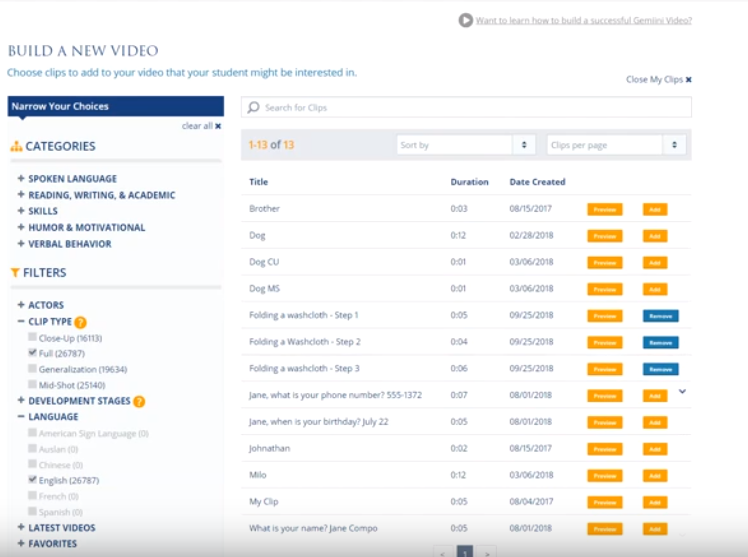 Your student can even be the star of their own videos, acting out how to complete an activity. Self-modeling is an effective way to learn new skills, and getting students involved in the creation of videos can be highly motivating! 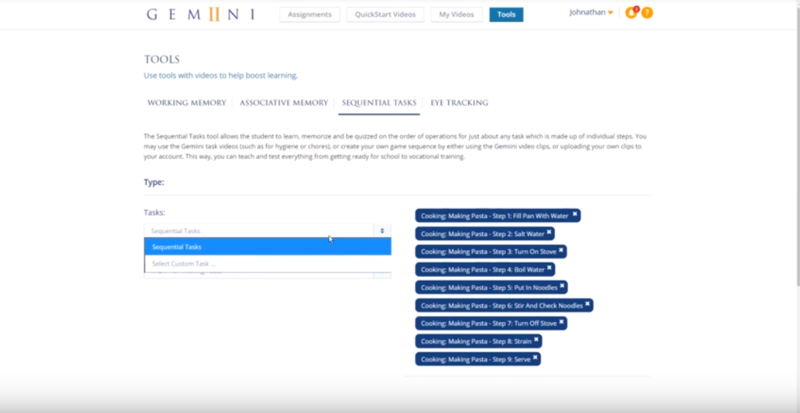 The first step in creating a Custom Sequential Tasks Activity is to film each step of the task separately and upload these clips to your Gemiini account. Each step must be contained its own short clip, so your student can practice arranging the individual steps into the correct order. 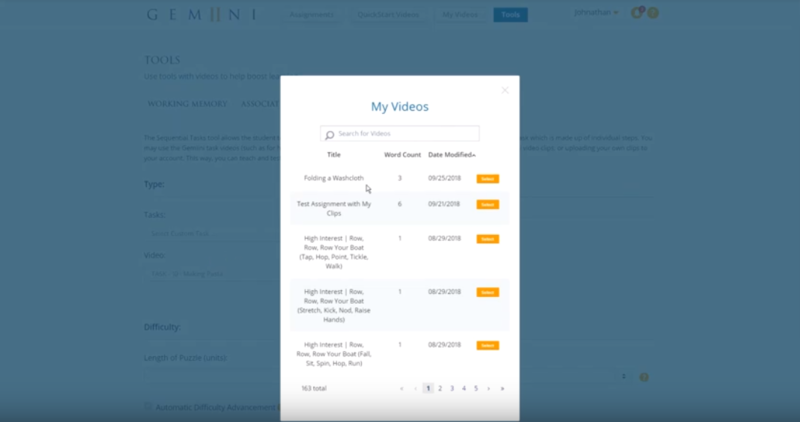 You can upload video files saved on your computer, or you can log in to Gemiini with the web browser on your phone, or any tablet with a camera, to film videos and upload them directly to your account. 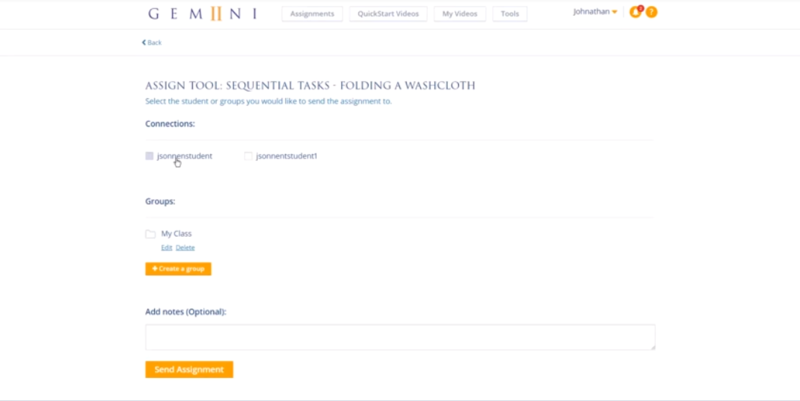 Follow the steps below to use a device to record and upload clips of each step in a simple task like folding a washcloth, so you can create a custom assignment to use with the Sequential Tasks Tool. 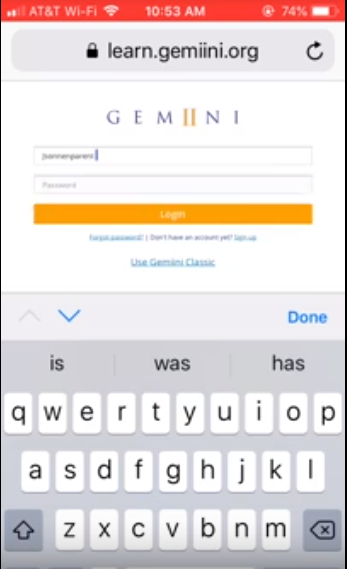 First, open a browser on your device and log in to Gemiini with your Managing Account. Select the My Videos navigation button. Then, select My Clips on the My Videos page. Select Browse to choose a video that you have saved on your phone or, select Take Video to film a new clip. 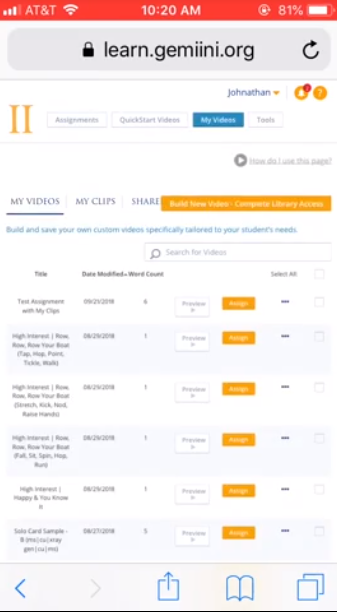 Remember: Each clip should show a single step in the task that you want to teach. When you're done recording, select Use Video. 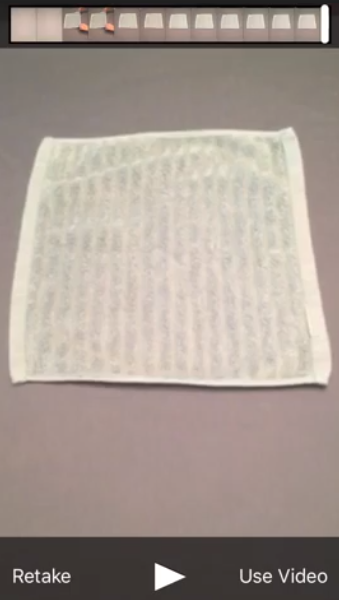 Give your clip a name, for example, "Folding A Washcloth - Step 1." Select "Submit." Repeat this for each step in the task. You'll receive an email that your clips have been approved within two business days of the upload. When your clips are approved, you'll need to choose an image to use for each clip in the Sequential Tasks puzzle - this is the image your student will see when they are placing the steps in order. Once you've done that for all of your clips, you'll add your clips to a custom video assignment. 1. Select the My Videos navigation button. 2. Select My Clips on the My Videos page. 3. 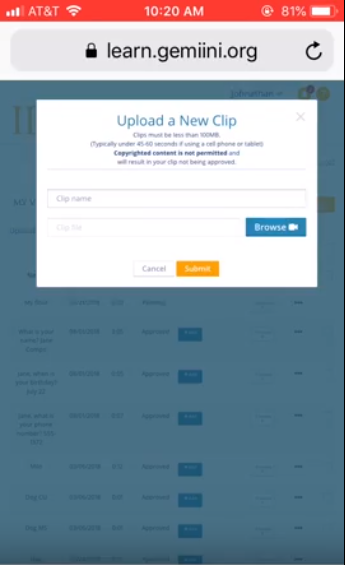 Locate your new clip and select the +Add button in the Image column. 4. Press play, or click the dot on the playback indicator, and pause the video on the image you want to use for the clip. Look for an image that clearly represents the action. 6. When you're happy with the picture, select Save Image. 7. Do this for each clip you want to use in the assignment. 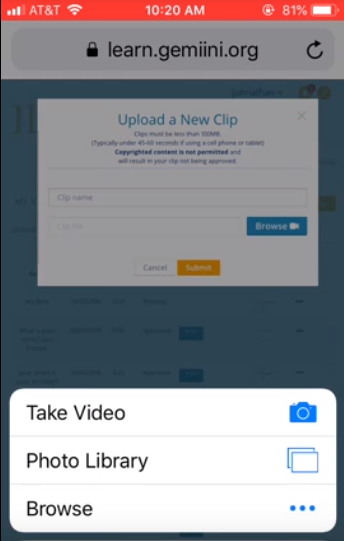 Once you've added an image for all of your custom clips, you can build a video assignment. Navigate to the My Videos section. Select Build New Video - Complete Library Access. Scroll down to the My Clips section of the sidebar. Check the box next to Custom Clips. Select Add next to each step in your custom task. Scroll down, and make sure the clips are arranged in the correct sequence. Give your assignment a title. 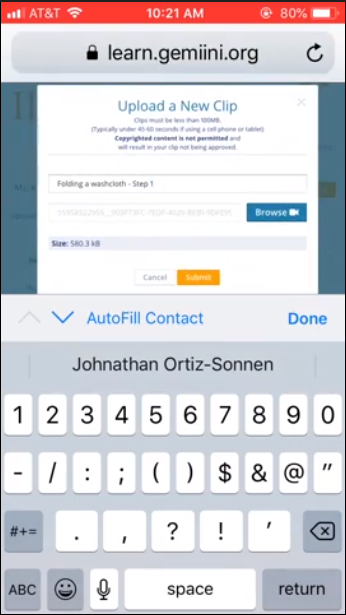 Select Save to save the video to your library of custom assignments. 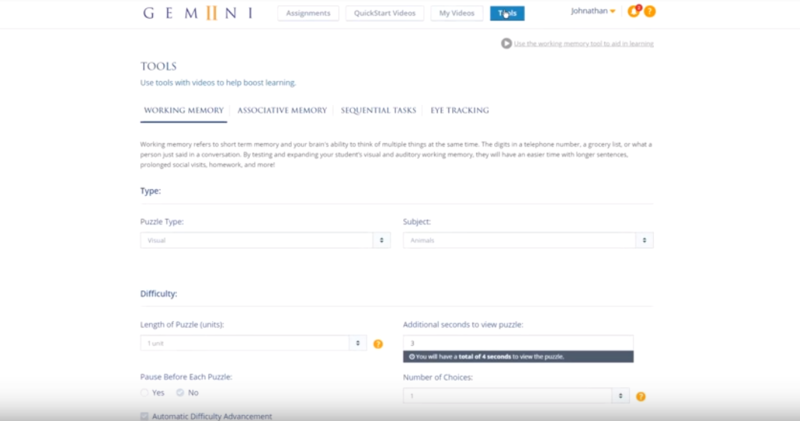 Now, you can set up a Sequential Task Activity using this totally customized video assignment! Select the Tools navigation button. Select Sequential Tasks on the Tools page. Under Type, select Custom Task from the Tasks menu. Select your new custom assignment from the My Videos modal. Make sure the clips are arranged in the correct order. Set the Length of Puzzle (Units) to the number of steps you would like to practice. Starting from the beginning of the task, the student will only see and be quizzed on this number of steps. Toggle Automatic Difficulty Advancement to determine whether or not the length of the puzzle will increase as the student gives correct answers. Turning this on shows the Length of Puzzle Goal menu. This number is how many steps you'd like to be the end goal of this activity. These settings can be used to create an activity that starts by showing only a fraction of steps in the task, and adds steps as yours student gives correct answers. Toggle Play "Tada" Sound When Successful to enable or disable the sound effect after a correct answer. Turn this off for students with sensory issues who might be frightened or overstimulated by the sound. 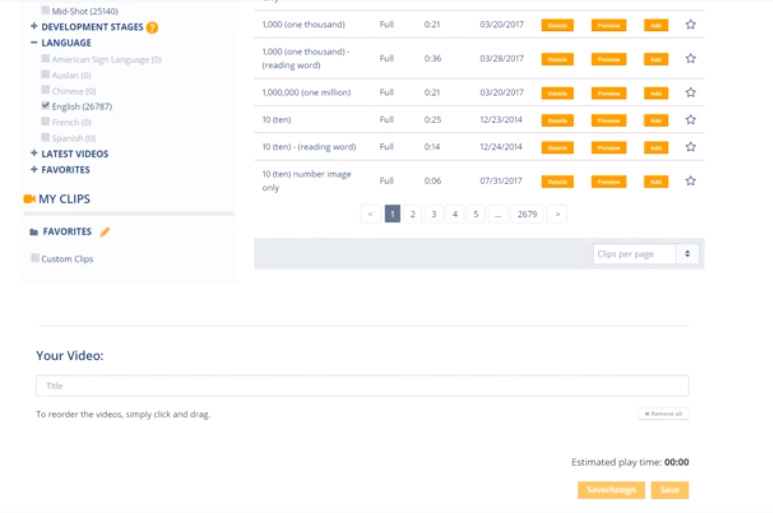 Once you've set up the puzzle, you can Preview it, or Assign it directly to your student by selecting the "Assign" button. Choose who you would like to assign the activity to, and select "Send Assignment". It will now appear on that student's assignments page. Select Play to start the activity. When it begins, your custom video will play, showing each step in the sequence. After the video, the images representing each step appear in a random order. The student should select them in the order they were shown in the video. Select "Finish" when you're ready to quit the activity. We use sequencing skills in every part of our lives. 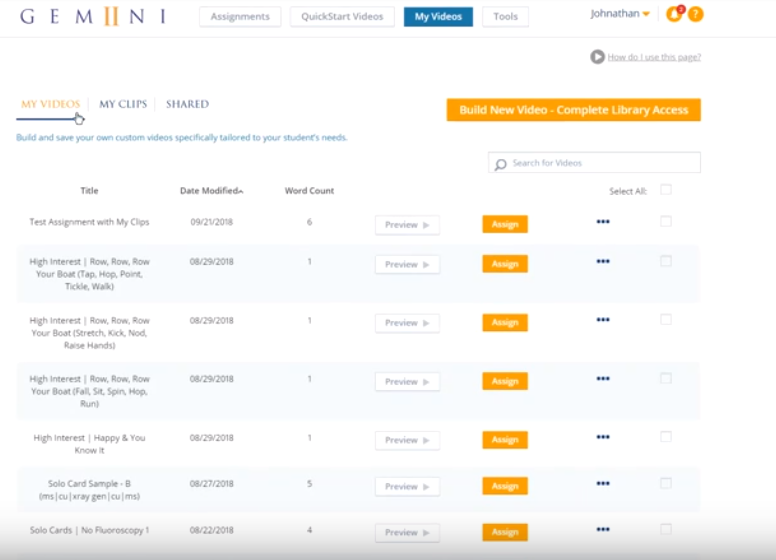 With custom uploads, you can teach the sequence of steps required to complete any task, and you can do so using familiar cues and objects from your student's environment. 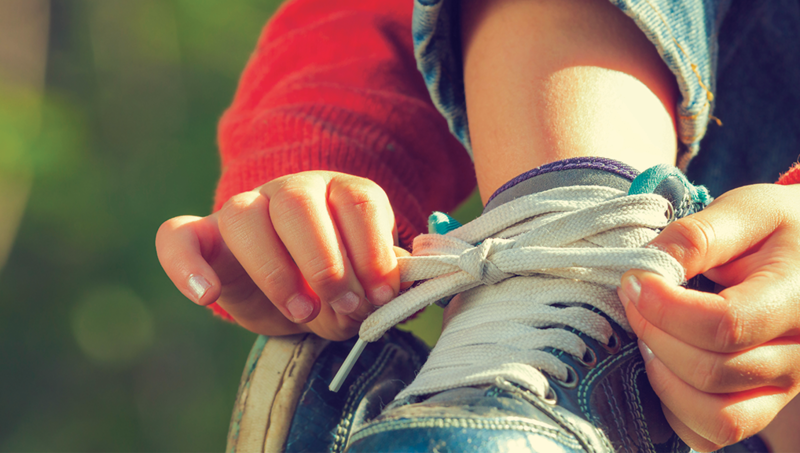 Use this method to teach the order steps in your student's morning routine, such as, how to put on their shoes, how to pick up their toys, or any other task that involves a sequence of individual steps. 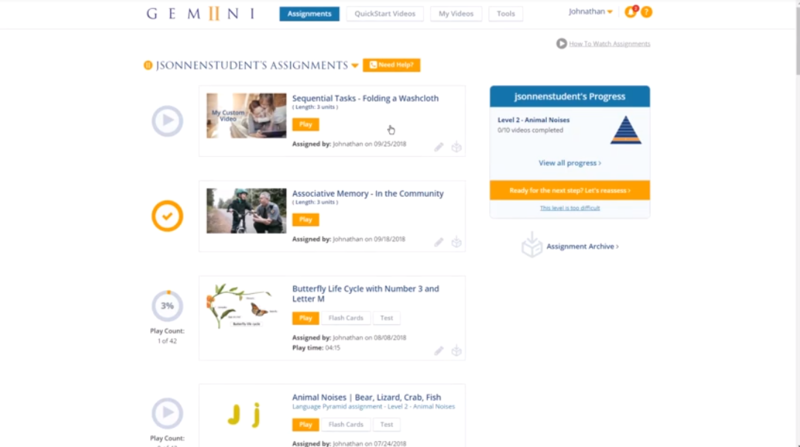 Log in to Gemiini to set up an individualized activity today!